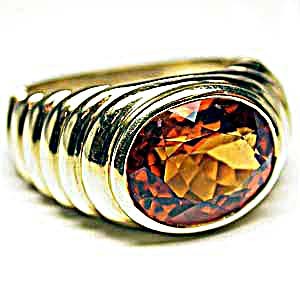 This scintillating 18K gold ring is set with a magnificent citrine gemstone weighing approximately 4.00 carat (11 x 9 mm). Smooth oval lines surround the center stone of this bold ring. The ring tapers from 10.8 millimeters to a comfortable 4.9 millimeter shank.